Jack Link's Beef Jerky likes to make mischief, but it has a serious side, too. 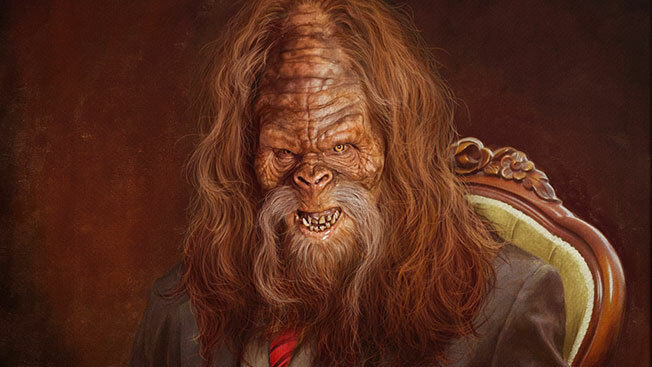 Take, for example, this new faux-oil portrait of Sasquatch, the brand's longtime mascot. Instead of chucking obnoxious millennials into mud piles—as he does in much of the brand's advertising—he's sitting in a plush chair, wearing a three-piece suit. Carmichael Lynch got artist Jason Seiler to create what it calls a "digital painting" to celebrate the agency's (and sister PR shop Spong's) 10 years of working for Jack Link's. It's the picture of dignity, too, except for the fact that Bigfoot is still badly in need of a haircut—that is to say, he still looks like the byproduct of a drunken one-night stand between a Klingon and a Wookie. Still, the fruitful relationship between Jack Link's and Carmichael Lynch has included the familiar "Messin' With Sasquatch" campaign, where salty beef snacks drive teens and 20-somethings to brazenly (some might say, stupidly) play pranks on a testy yeti. It's also produced, more recently, the brand's "Hangry" effort, which charmingly imagines vicious animals that exist inside any person who hasn't had enough beef snacks. Unsurprisingly, Jack Link's irreverent "Feed Your Wild Side" platform aims to attract 18- to 49-year-old dudes, and the brand has been expanding its sponsorship slate to help reach that target. Now, Jack Link's sponsors the Seattle Mariners, which this year joined the Minnesota Twins and the Detroit Red Wings on the brand's roster. It has also partnered with the Boy Scouts and GoPro, and tied Sasquatch into college sports with a campaign around the Big Ten conference. Last year, it showed up at Comic-Con, backing Seth Meyers' Hulu cartoon The Awesomes, and since 2012 it has served as the title sponsor for a show on the Outdoor Channel called Jack Link's Major League Fishing. Because what better way to pass the time while waiting for a catch than to gnaw on jerky? The company's recent market blitz extends beyond just branding, though. Based in Minong, Wis., Jack Link's in early 2014 announced plans to buy Unilever's meat-snack business in Europe (where it may soon be doing more in-store cardboard cutouts of women wearing nothing but bags of beef jerky). Founded in 1986, Jack Link's has since become the best-selling beef jerky around the world. And while absurd and amusing advertising like beef-jerky mosaics of President Obama and Mitt Romney during the 2012 election has helped drive that success in the U.S., by far the brand's most impressive effort came in 2013, when it air-dropped thousands of packets of beef jerky over a baseball complex in Nebraska—crossing the line from public relations into true public service. Now, someone please get Sasquatch a razor. • Jack Link's makes 100 different kinds of meat snacks, sold in 40 countries. • Meat snacks are a $2 billion industry in America. • Jack Link's is the official protein snack of the Boy Scouts of America. • For true connoisseurs, Jack Link's makes small-batch, "handcrafted" beef jerky. • For 2014's Beef Jerky Day on June 12, the brand created "Meat Rushmore," a 13-by-17-foot Mount Rushmore in New York's Columbus Circle. • For the man who has everything: A Jack Link's "Adventure Pack" comes with nine meat snacks, a hat, sunglasses and a Sasquatch bumper sticker. • Jack Link's jerky-making process dates to the 1880s, when Chris Links came to Wisconsin from the "old country" and brought his sausage recipes.